Any Muslim American can tell you about the humiliating experience of watching poorly portrayed Muslim characters on TV or in movies. As if the discriminatory and degrading rhetoric of any given administration, the media, or the general public was not enough; minorities have watched themselves be completely misrepresented since the creation of TV and film. Some examples of this include Katherine Hepburn in Dragon Seed, the infamous Mr. Yunioshi from Breakfast at Tiffany’s, or Laurence Olivier playing Shakespeare’s Othello. However, these examples are from times when people of color lacked so many basic rights that having a white actor play them was probably the least troublesome part of being an American. Shouldn’t things be better today? Why do shows like Homeland continue to portray one-dimensional, evil Muslims or use Muslim women as oppressed props that Claire Danes has to come save? The list of backwards portrayals goes on. While in the past minorities were simply not used or typecast into the same recycled stereotype, today more minorities are cast in complex roles and are dramatically changing the process behind the scenes as writers, casting directors, and so much more. Hasan Minhaj’s first Netflix project is a stand-up special based on his experience of growing up in Davis, California as a Muslim Indian-American. His storytelling skills include detailing everything from his parents’ journey to America to his marriage. This delightful watch is a funny and bold truth of our experience. Through his own life, Minhaj depicts all the different conflicts regarding identity and responsibility young Muslims can relate to. Following the success of his stand-up special, Minhaj has started this satirical show discussing current political and cultural issues. He blends very serious and sometimes alarming problems with humor to reel in a diverse audience that may otherwise never pay attention to those issues. It’s a quick and fun watch and diverts from the typical issues that Muslim Americans discuss. His show expands on topics that concern everyone. The limited series follows the story of a young Pakistani-American man from Queens that is accused of murdering a woman. While all signs and social perceptions point to him, his lawyer (played by John Turturro) works to prove him innocent against all the political and cultural suggestions. Riz Ahmed stars in this adaptation of Mohsin Hamid’s novel. Mira Nair directs the story of an ambitious Pakistani man working on Wall Street whose entire world changes after 9/11. The film questions the troublesome treatment of Muslims and foreigners after the terrorist attack with a personal look at the main character’s conflicts. 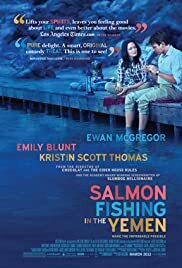 The film follows a fishery expert helping a sheikh accomplish his vision of fly-fishing in Yemen. This charming film disposes the common stereotypes of an obsessive and cruel sheikh. Though it is not specifically related to the Muslim experience, it is a much needed light-hearted representation of a Muslim, a sheikh named Muhammad. Despite being able to instantly stream these great works courtesy of hard workers and 21st-century tech, our job is not done. Not everyone is going to relate to a coming-of-age stand-up comedy show or agree with the specifics of every Muslim character. But that is the beauty of it. The process of creating art is endless and limitless. We have to continue to share our unique experiences in our own voices by becoming integral forces on and behind the screen. Not every story has to detail our struggles or even relate to something specifically Muslim. We need the rest of the world to see Muslims in everyday professions so that we can connect with them through our universal struggles.